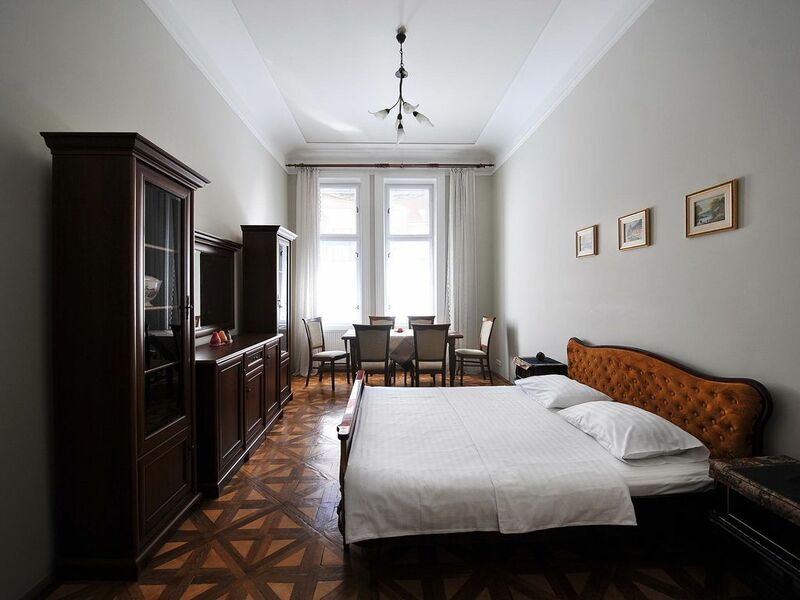 4-room apartment in the heart of Lviv. The apartment is located on one of the oldest streets in the city centre near the Rynok Square (2 minutes walk). This location is the best to visit the historical sights and museums. A lot of restaurants, cozy cafes, nightclubs around. Everything at your doorstep shopping center, food stores, Galitsky market, excellent transport links - the ideal Lviv experience. Panoramic view from the windows to the Danylo Galitskyi monument. The apartment (total area 148 sq.m.) is located on the second floor of a five-storey historic building. Clean and tidy facade entrance, equipped with an intercom. There is a guarded parking in front of the house. High ceilings, all rooms are separate. There are two bathrooms, one - with a shower cabin, the second - with a large corner bath and bidet. The apartment is fully equipped with comfortable furniture and all home appliances: 2 TVs, washing machine, hair dryer, iron. Spacious separate bedrooms with comfortable double beds and folding double sofa beds will only help to relax after a sightseeing day. Autonomous heating installed, hot water round the clock. Equipped kitchen - refrigerator, stove, oven, electric kettle, crockery, kitchen utensils and tableware. You can use Wi-Fi and cable TV. Spacious wardrobe rooms, where you can put your luggage with maximum comfort. We provide clean sets of bed clothes and towels to each guest. The apartment has all the conditions for an excellent holiday!